1. Consistently demonstrate practical, affordable energy efficiency and renewable energy ideas, devices, and systems at the over 4000 weekly farmers' markets that take place across the USA from Memorial Day to Halloween or Thanksgiving. The people who attend farmers' markets are a core constituency for green technology and practical applications that save money, energy, and resources. They are likely to be early adopters who can spread those possibilities into the community. I've done energy demos at my local farmers' market and know that a renewable energy company sometimes participates in the year-long weekly market near Providence, RI. I wouldn't be surprised if there were more examples out there. Do energy education weekly at as many of those 4000 weekly markets as possible and over one growing season energy use and attitudes would change significantly. See Mr Franklin's Folks for one vision of how this might work. During the last energy crisis in the 1970s, there were groups that did solar barnraisings too. Some of those solar devices are still working. Personally, I'd like to see a weatherization barnraising on the White House. With the full participation of all the TV carpentry shows, "This Old House," "Extreme Makeover: Home Edition," the HGTV and DIY channels.... It could make for some great PSAs and instructional audio/video and the power of the President's bully pulpit (plus a little of his own sweat equity) would go a long way toward generating the mass movement toward energy efficiency that we should have undertaken thirty years ago. 3. Energy education could also work in conjunction with emergency preparedness and civil defense. Start with the basics - flashlight, cell phone, radio, an extra set of batteries.... all of which can be powered with a couple of square inches of PV. Add a hand crank or pedal power back up and you have reliable production of AA and better electricity day or night, by sunlight or muscle power. 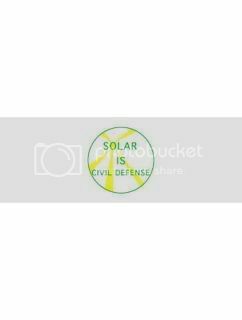 Solar IS Civil Defense, pure and simple. It is also a significant rise in the standard of living for the 1.6 or so billion people in this world who don't have access to electricity today. In fact, there are organizations where you can join a buy one give one program and support coordinated development in the developing world with civil defense in the developed world. 4. 350.org's next event is an international climate change work day on 10/10/10. If groups going to farmers' markets weekly and doing monthly energy barnraisings monthly organize with that October 10 in mind, that event could make an even bigger splash and larger impression on the general public. Weekly energy demos at farmers' markets and monthly energy barnraisings could also continue after that one single international work day so that the work continues and we all change the way we use energy, from wasteful and polluting to efficient and clean. 5. Build an information network so that different groups working on these issues around the world can share experiences and speed innovation. It is way past time for the changes we need. We shouldn't wait for politicians or business to change. We should start making the changes we need ourselves. Begin the parade and there will be plenty of "leaders" ready to run to the front of the line. Quite clearly, our task is predominantly metaphysical, for it is how to get all of humanity to educate itself swiftly enough to generate spontaneous behaviors that will avoid extinction. We remain alert so as not to get run down, but it turns out you only have to hop a few feet to one side and the whole huge machinery rolls by, not seeing you at all.